On April 20, 2011, Jean-Claude Brizard, former superintendent of the Rochester City School District, made a formal announcement of his departure from Rochester, NY to take a position as CEO of Chicago Public Schools, effective immediately. The Coalition for Justice in Education as well as the Community Education Task Force had statements regarding Brizard's departure. This video contains both press conferences with q/a from Brizard's press conference. Education activists in Rochester, NY send messages of support to education activists in Chicago, IL letting them know all about Jean-Claude Brizard--the Chicago Public School District's new CEO. On March 11 and 12, a Community-wide Summit for Educational Change will take place. Will this be another talk session with inspiring words but short on follow-through and action? Over our dead bodies. Everyone interested in inclusive, collaborative, real education reform efforts in the Rochester City School District will have an opportunity to contribute to the development of a realistic, focused plan. NY,Gov. Andrew Cuomo proposed to cut 1.5 Billion dollars in education. Here is the Youth Empowerment Production Program response to why this is a BAD idea. Michael Jackson's song "They Don't Really Care About Us" is our mantra to why we cannot stand around and let this happen. 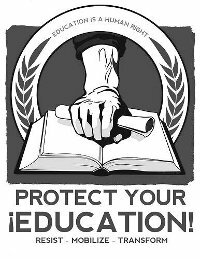 The latest here in Rochester, NY in our “war for the soul of our schools”. 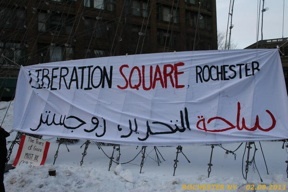 On Wednesday February 8, Activists in Rochester braved freezing temperatures and a sub-zero wind chill to show their support for protesters in Egypt. Egyptians have been demanding the resignation of President Hosni Mubarek since January 25. The Egyptian demonstrators finally won their chief demand on Friday, When Mubarak stepped down.